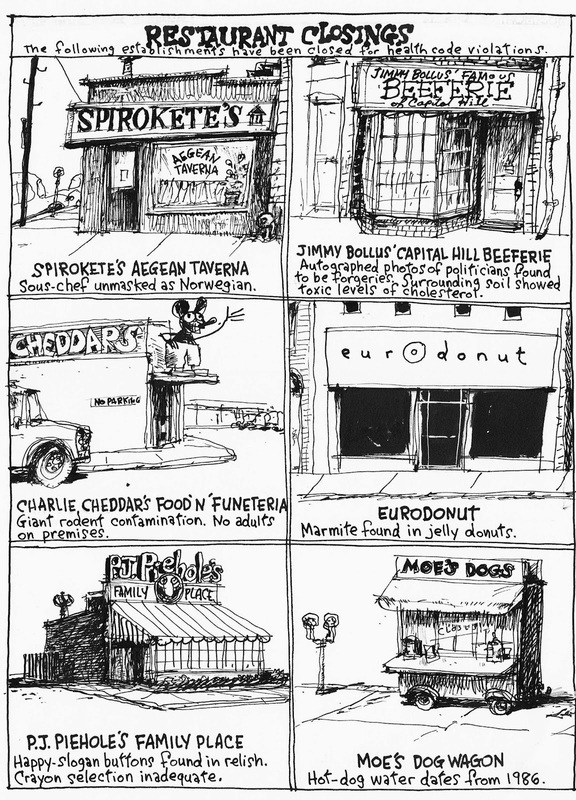 Bado's blog: Restaurant Closings in "Richard's Poor Almanac"
Restaurant Closings in "Richard's Poor Almanac"
The first appearance of "Restaurant Closings" in Richard Thompson's strip. Closed Friday for operating without a certified food manager. Closed April 19 for operating without a license, gross unsanitary conditions and operating without a certified food manager. Reopened April 23. Closed Friday for failure to minimize vermin, circumstances that might endanger public health and improper food holding temperatures. These columns appeal to me for all kinds of reasons: the poker faced style, the easily graspable nature of the incidents and, in the case of the health code violations, the fact that restaurants are fun to draw. When I was doing the Poor Almanac (1997-2009) and was looking for an idea (always) I could usually scare up enough jokes to fill out the cartoon without the desperation being too apparent. Because restaurants are not only fun to draw; they're inherently funny. Here's one of only 4 or 5 in color, from c. 2000. 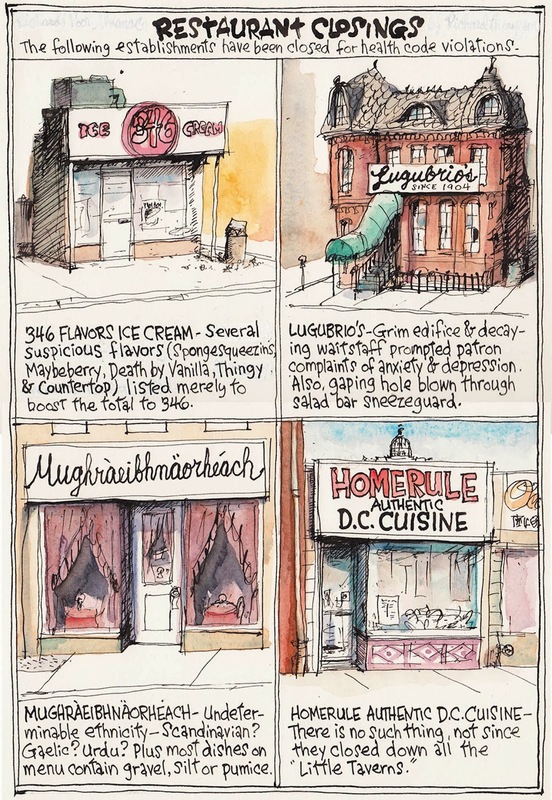 Lugubrio's is based on a place near Dupont Circle where the lights were so low the waiters were disembodied voices and you ate by feel, often off another's plate. Bob Mankoff: the story behind "How About Never?"